This week is our twentieth wedding anniversary. Neither of us can quite believe that it has been twenty years. At the same time, it feels like we were married yesterday and that we have been married forever. Really forever. As part of self-congratulation week, we decided to treat ourselves to special gifts. I decided I wanted an upgrade to my wedding band. 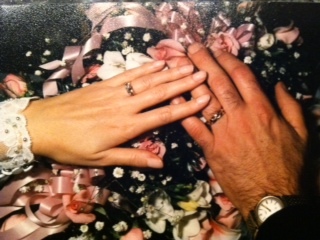 My original wedding band has five very small diamonds. I wanted to keep the band for sentimental reasons; after all, my husband put that ring on my finger in Church, for God’s sake (literally, for God’s sake). But I could upgrade to bigger diamonds and that would look awesome with my engagement ring – which we awesomely upgraded already on our tenth anniversary. I ducked out early from work. When we parked in front of my favorite jewelry store, my husband put a quarter in the parking meter. A quarter! That’s thirty minutes. I knew what I wanted, but the notion that I could look at jewelry and make a decision in a half-hour was just insanity. Of course, the store was only open for another hour, or he would have needed eleven quarters. One hour barely gave me enough time to check out everything else in the store, which I absolutely had to do despite knowing what I wanted. I loved the sapphires, the pearls, all the mysterious and beautiful stuff in the estate case. I did the full circuit while negotiating for the wedding band. We got a great deal on a beautiful setting, offset slightly by the cost of the parking ticket. Of course, the parking ticket wasn’t the only additional expense. I had to leave my ring with the jeweler. He estimated that, given the Thanksgiving holiday, it would take two weeks to get the new setting and make the change. But it’s my twentieth anniversary. I don’t want to be without my ring. I don’t consider myself superstitious. But I suddenly felt very queasy walking out that store without my wedding band. I felt horrible all evening. I had to have a ring. I considered going to a pawn shop to pick up a wedding ring, but that doesn’t exactly fit with the whole superstitious thing. I mean, how did a wedding band get to a pawn shop anyway? I don’t want to wear someone else’s problems, even for two weeks. So the next day I went to Wal-Mart and bought myself a gold (albeit plated) wedding band. I figure I can pawn it when my newly-enhanced ring comes in. Tomorrow: Part Two – HIS turn. Happy Anniversary! I understand feeling naked without your ring. When I was pregnant with my daughter, I became allergic to gold jewelry and couldn’t stand to be ringless. Picked up a sterling silver band at the mall to tide me over until we could replace my original gold rings with platinum. A great story. I have a story about my multiple wedding rings that I’ve been meaning to post. This is a good reminder to get to it! And happy 20th anniversary. Your story is a comforting one for me because both of our children are in their early 40’s and newly single. So I’m praying that both of them find their perfect mate this time, and get to celebrate a 20th anniversary of a happy union. Happy anniversary! I always thought the 20th was the vacuum-cleaner anniversary. According to Hallmark. Diamonds are always better. Congratulations and wishes for at least 20 more years of bliss. Congratulations!! That is so awesome!!! We have talked about redoing our bands next year for our 30th—-so many decisions on what to do tho!!! I have an awesome anniversary ring but my rings are all gold and I usually wear silver these days so we are thinking maybe going that route. I don’t know. I can’t wait to hopefully see what you came up with !! Congratulations. What a lovely two digit number 20. Congrats! I hope I see my twentieth with Mr. Wonderful. We are only married four years so there is a good chance, given our age, that we won’t. However, I did make sure I got a good ring on the first round (wasn’t sure how big diamonds look on 80-year-old knuckles!). Diamonds look GREAT on old hands. Trust me. Congratulations on your 20th wedding anniversary. It’s heartwarming to hear happy stories about truly married couples who MAKE it. Congratulations!! What a wonderful anniversary! My husband and I will celebrate our 20th in just under 10 months. I know exactly what you mean when you say you got married yesterday and yet you’ve been married forever. Some days it feels like a longer forever than others but you probably know about that too! And yes, when it comes to shopping, I think men have a different sense of time. Mr. Frump — God love him — will never understand why any trip to a clothing store will take me an hour, at minimum. Congratulations. I’m sure it’s your ability to laugh at and with each other that has kept you together. May it continue for at least another 20! Happy Anniversary! I believe the common 20th anniversary gift is a bagged assortment of jewels. You can show your husband my comment if he needs verification, but I really know about anniversaries so that shouldn’t be necessary. Congratulations on your twenty years together. I loved the post. I think jewellery is a fabulous idea. Maybe you can get a deal through Cyber Monday!!! Congratulations on your 20th. I can absolutely understand you not wanting to be band-less. But can also understand not wanting a pawn-shop wedding rings. Yikes! Very sweet, and so you, Nancy. For tomorrow, I’m thinking golf clubs. That is so awesome! I can’t wait to see the story about his turn! Congratulations! First thing–Congrats on your 20 year anniversary! It seems like these days it’s an eternity for couples to make it that long–sad but true. I completely get your hesitation to be without your original wedding band. About 8 years ago I was playing catch football with my son and jammed my finger. Had to go to the hospital to get my wedding ring cut off. Since then I haven’t gotten it resoldered because I would have to leave it at the jeweler’s for several days and I am too nervous (i.e. superstitious) to do that. Sounds crazy. Same reason I haven’t upgraded my wedding ring because I feel like I’ll jinx things if I switch to a new ring. I swear I’m getting crazier with every year!! I think it’s a testament to the strength of your marriage that the temporary Walmart ring works as a perfect stand-in. Congratulations!!! And he was actually pleased when I came home and showed him the Wal-Mart ring. He liked that I didn’t want to go without a wedding band even for a short period. He’s definitely a sweet gun-nut.